The MET Extension project, funded by the Bill & Melinda Gates Foundation, is cataloguing and making accessible to researchers a large collection of videos of mathematics and English language arts teaching in U.S. classrooms. also help to improve the collection over time through their feedback and shared work. The teachers participating in this project started recording lessons in January 2012. They are using specially designed camera units that allow for capture of the classroom, the board, and high-quality audio from both the teacher and the students. Researchers at Westat worked with districts, schools, and teachers to collect the classroom observation data and to create video files that can be viewed and used online. Videos are “tagged” with labels that enable users to easily search and find relevant examples of teaching practice to match their interests and needs. Researchers at TeachingWorks developed the tagging scheme based on high-leverage teaching practices and the Common Core State Standards, with input from teacher training institutions and other organizations. Instructional practices tags, or tags related to specific instructional practices and strategies that are being used in a lesson, such as whole-class discussions, small group work, and particular classroom management practices. Many of these tags correspond to the TeachingWorks high-leverage practices, which are instructional practices that are fundamental to competent teaching. Common Core State Standards (CCSS) tags, or tags related to the Common Core State Standards in English language arts or mathematics that are being addressed in the instruction in the video. 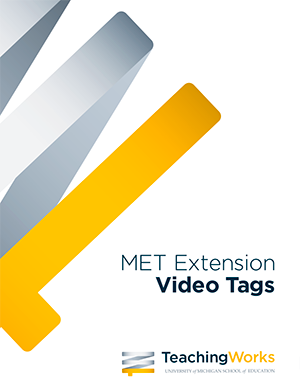 Not included are tags that would apply only at grades K- 1 or above grade 9 because the MET Extension videos are from fourth through ninth grade classrooms. The tags are applied to video at five-minute intervals. In any given five-minute segment, multiple tags may be applied. Tags are not mutually exclusive within a given time segment, but the descriptions of tags were written so that the application of any given tag didn’t require the application of a second tag. For more information on the tag scheme development process, click here. The tags based on the Common Core State Standards differ from the actual standards. The CCSS comprise a set of learning goals for K-12 students. In contrast, the tags describe what students and teachers are working on together in the classroom in relation to those learning goals. They do not suggest that students have learned specific topics or practices. The tags are also not evaluative. That is, they do not indicate the quality or integrity with which a specific aspect of content is being taught or learned. They are descriptive markers that indicate that a particular aspect of mathematics or English language arts is being worked on by the class, by either teachers or students. The tags map to the CCSS but the tags are not always in one-to-one correspondence with the Common Core. In some cases, the items from the CCSS were reorganized to make better or more usable grain-sized tags, particularly in mathematics. For example, one of the mathematical practices items that is part of the Common Core is, “Students make sense of problems and persevere in solving them.” For the purposes of the MET Extension project, this practice was divided into two tags, one for making sense of and interpreting problems and the other for work on persisting with difficult problems. This allows the collection to be labeled more precisely. If you have questions about the MET Extension project, please contact info@teachingworks.org. To view the tag scheme booklet click here or on the booklet below.